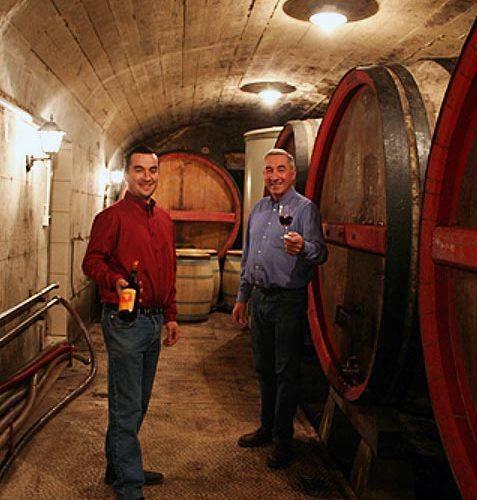 Domaine Paul Durdilly is a small father and son team with some of the highest vineyards in the generic Beaujolais appellation. This is one of the few 100% estate-bottled, hand harvested, indigenous yeast basic Beaujolais available in the United States. If you follow a topographical map of the Cru villages southward to the tiny hamlet of Le Bois d'Oignt you understand why this is the logical extension of the chain of hills that give us the world's finest Gamay. The vineyards here are a geological mix of granite, schist, river debris and clay that vary remarkably from site to site in the hills around Le Bois d'Oingt. Paul's finest parcels that make up our blend have a higher proportion of granite and limestone than the average Beaujolais. The average altitudes here are only slightly lower than many cru plots to the north. Some of the deeper chalk soils give Gamay here a pinot noir-like silky fruit; while the grapes that come from more granite laded plots give you more grip, spice and fresh acidity. These hillside, old vines sites around Le Bois d'Oignt are very different than the rest of Beaujolais and give Paul's Gamay here a bit of added depth and complexity. Every year we make two selections, one is juicier and more floral that forms New Yorks best Nouveau each year. The second is a limited blend of very expressive, fruit driven, mouthwatering and spicy Gamay that we can deliver pleasure for multiple years. Mostly old-vine fruit (many are pushing 70 years old; the average is 40) is aged in a combination of tank and very old, large foudre. This is a floral festival in glass with blue and dark flowers dominating. The palate is silky with raspberry/cherry notes supporting a fresh bright finish.